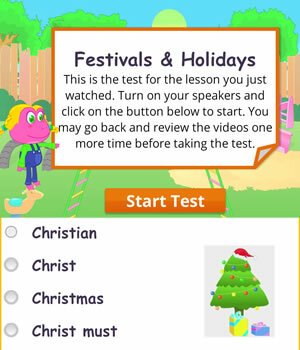 Teach English learners the names of different festivals and celebrations across the globe. Teach ESL/EFL young learners key vocabulary, actions verbs and expressions used when talking about the things we do during festivals. 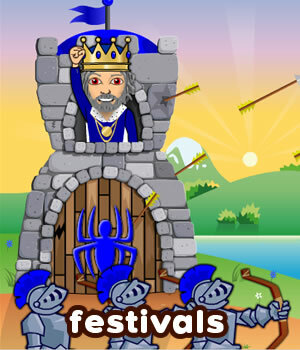 This ESL kids lesson enable learners to quickly associate specific actions with specific festivals. Tacitly introduce the idea that statements can be turned into questions in conversations by use of an inflectional intonation at the end – Example: Eight days of presents? Such questions are usually exclamatory and rhetorical in nature. The worksheets below are useful for offline and classroom activities. 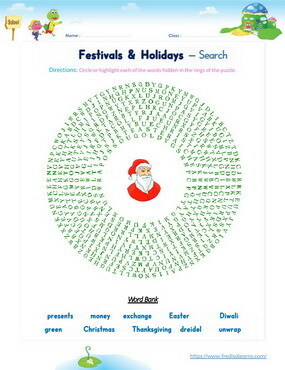 These printable exercises directly correlate with the above lesson 'Festivals Holidays'. Every worksheet comes with an answer sheet on the second page for educators. Freddie, Lisa and their parents are unwrapping Christmas presents sent by Santa. A conversation about different festivals begins. Freddie and Lisa get to learn a lot about different festivals from Mom and Dad. We get presents from Santa. We unwrap the presents on Christmas morning. During Hanukkah we play a game called dreidel. On Valentine’s Day, we exchange cards. On Thanksgiving, we eat a big turkey. Parents give money to children in red packets during the Spring Festival. On St. Patrick’s Day, we dress up in green costumes. Freddie: Wow! Santa brought me a leap blaster! So cool! Lisa: He brought me the doll I wanted! Freddie: I love Santa. I love Christmas! Lisa: It’s my favorite holiday! Mom: What other holidays do you like, Lisa? Lisa: Well, I really like Valentine’s Day. Dad: What do you like about Valentine’s Day? Lisa: I like exchanging cards and getting chocolate. Mom: Do you know why we have Valentine’s Day, Lisa? Mom: It’s a chance for everyone to show someone they love them. Freddie: Do you know my favorite holiday, Mom? Mom: No, what is it, Freddie? Lisa: What do you like about Thanksgiving, Freddie? Freddie: We get to eat a big turkey! Mom: Do you know why we have Thanksgiving, Freddie? Freddie: We are supposed to be thankful, right? Dad: Yes, Freddie. Thanksgiving is a time to be thankful for the people in your life and what you have. Lisa: Does everyone celebrate Thanksgiving? Dad: Other countries celebrate it differently. In Canada, they celebrate it in October! Freddie: But it’s supposed to be in November! Dad: In America, yes. But in Canada it’s different. Different countries celebrate holidays differently. Freddie: What about Christmas? Does everyone celebrate Christmas? Mom: Different countries celebrate Christmas differently, and some people don’t celebrate Christmas at all. Lisa: They don’t celebrate Christmas? What do they celebrate? Mom: Well, people who are Jewish celebrate Hanukkah. They have eight days of presents and they play a game called dreidel. Lisa: Wow! Eight days of presents? Mom: Yes. But only one or two presents each day.